I have fond memories of going to the Jahn's in Long Beach in the early 60's. They had the best burgers and sundaes! I do remember the Kitchen Sink but never ordered one. I miss the summers I spent in LB all through my childhood. We had a small 1920's Bungalow on Oregon St on the beach side. I had my first birthday there back in 1946! My daughter and family built a new beautiful house on the same, small 30x60' property. I'm living in Florida now and go to the Sarasota beaches, which are beautiful, but the sand in Long Beach is soft compared the the sand on the Florida Gulf coast. I am thinking of writing a book or document. I have the old menus and postcard and a few photos and my cousin Eric, who worked the rail and the grill, and myself, could muster up some memories. Unfortunately, my father passed away 9 years ago and my uncle was killed in 1973 by a speeding police car while driving home some workers to Patterson at 3 AM. That is why they sold the business to a Greek fish restaurant and closed Jahn's. I had the best birthday parties supplied with Jahn's food and dad would bring home my favorite "swiss rolls"- vanilla ice cream rolled up in chocolate cake! My father was a really good chef at home as well but the restaurant business was physically demanding. He bought all of his fresh fish at the Fulton Fish market, fruits and veggies at Hunts Point and we went to Tribeca for meat,eggs and cheese. Coming from Long Island, they each drove 1 hour each way across the newly built Throgs Neck Bridge. It was a difficult life but everyday brought a new experience and satisfaction because of the engaging and grateful customers. Thank you also, Donna Seftel for your account...iit was your DAD'S Jahns that we went to....I couldn't remember the town of Fair Lawn, but knew it was off Rt 4 west of Paramus...It's one ome cherished memoriers of my childhood...thanx again!!! Thank you, Donna, for that delicious account. My father Lawrence Seftel and uncle Kurt Seftel built and owned the best and biggest Jahn's (sat 300-400 people) on Route 4 in Fairlawn, NJ ( now The Palm Steakhouse) from around 1960 to the very late 1970's. I worked there as a waitress and hostess,summers and lived on ice cream. I ate every topping and flavor behind the rail and knew the secret language to place an order: "gorillas" were banana pancakes, "radio" was tuna on toast, "white in " was a vanilla malted (I think), and so on. They had a nickelodean and old time movie machine with flip cards. The kitchen sinks were served with sparklers and you received a free sundae and serenade on your birthday. There were lines out the door and they were open until 2 AM weekends. To this day, everywhere I go, people remember my dad's Jahn's. The menu was huge and he made a special matzah brei on Passover. They were the friendly neighborhood family restaurant and hangout without the need to serve alcohol. 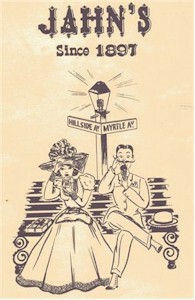 They also owned the Jahn's in Union, NJ and Long Beach, NY and Regal House, a fancy French restaurant with piano bar on 69th St. and Lex. Ave. in NYC. I will post some photos soon. I thought the Jahn's was on Rt 4, west of Paramus...went there once as a kid...today there are no more ice cream 'parlors'...I don't count either Friendly's or Baskin Robbins as such...I've been living in So FL since Aug of '79 and have yet to see one!!! CB in FL...thanx for the memories!!! There was a Jahn's in Richmond Hill, Queens, next to the RKO theatre. Sadly, I think all the Jahn's are history now. This healthy schoolboy blissfully ordered himself "The Kitchen Sink" at Jahn's many June's ago to celebrate his graduation. Celebrated our Birthdays at Jahn's. Dad took us to Jahn's...in Queens....Jamaica I think. Old wooden benches and seats with names that customers carved into them over many many years......old place with a nickelodeon in the back. 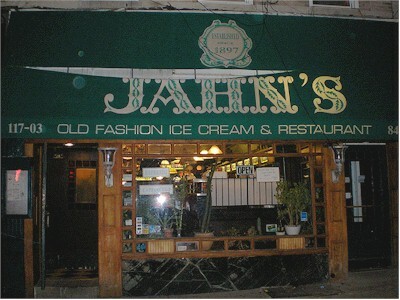 I went to the Jahn's on Fordham Rd.in The Bronx,NYC years ago..I enjoyed their ice cream. It's sad that the one in the Bronx,NYC is gone now. The aforementioned "Fordham Road Jahn's" was actually on the lower end of Kingsbridge Road, 1 1/2 blocks before it merged with Fordham Rd. My Irish grandmother took me there several times and sat me at the ornate, latticed soda counter for ice cream sodas directly from the tap. My favorite was pistachio ice cream in Coca Cola. The last one I had was in the summer of 1969. I substituted Mint Chocolate Chip. It was just as satisfying. Their ice creams (before the onslaught of designer ice creams) were whipped and very creamy. Wife's from Queens. She remembers a dish called "Tall in the Saddle". Says you had to stand up to eat it! If you ate a Kitchen Sink, you got another one free....urrppp. I remember my Grandma taking me to the one on Fordham Road in The Bronx around 1960. Jahn's also had a popular place in Union Township, NJ, but I think the first one was in Queens in NYC. Other ice cream parlors may now offer huge "Kitchen Sink" sundaes, but Jahn's was arguably first.